In April 2011, it was announced that security researchers Alasdair Allan and Pete Warden had developed an application which exploited the consolidated.db file held on iOS devices, allowing users to visualise the information it contained to display/track their movements. Following this, Apple released a statement explaining that the company wasn’t tracking users via this data. In a Q&A on Location Data, featured on their website they explained that the consolidated.db file was maintaining a database of Wi-Fi hotspots and cell towers around your current location, some of which may be located more than one hundred miles away from your iPhone, to help your iPhone rapidly and accurately calculate its location when requested. Since then, Apple has released an updated version of iOS (4.3.3) which has quashed this tracking bug. I’m a little curious about what the iPhone Tracker app has uncovered on my phone. Several points on the map indicate that I have been in both the Middlesbrough and London areas since I purchased my phone in January 2010. On closer inspection, it says I was in Middlesbrough on the 8th July 2010 and that I was in London on the 26th August 2010. In reality, those days were spent in an office in Dundee. Perhaps this is a flaw in the way Apple captured the data? The iPhone Tracker made me think about where I’d been though. I came to the conclusion that the map shouldn’t show any points outwith Scotland. I got my phone at the beginning of 2010 and haven’t actually been out of Scotland since June 2009. Of course, a portion of the North East coast was littered with markings as I travel along it frequently. 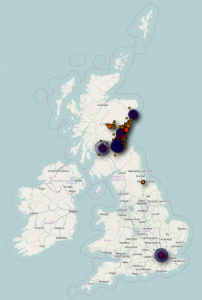 I noticed quite a few points for Glasgow (Michael Bublé and Bryan Adams concerts) and Edinburgh (visits to the Fringe festival). I myself haven’t updated to iOS 4.3.3. Why not? In a few weeks, I’m off to NYC and when I return home, it’ll be interesting to see the additional points which have been plotted on the map. It’s a pity I didn’t have an iPhone when I did my USA/Canada trip in 2009. I think we covered 1500 miles on the bus over there- that would have produced some interesting data! This evening, I plugged my iPhone into my computer and when iTunes opened, it informed me there was an update available. I like to keep my software up-to-date, so I started to download the OS update. Big mistake. The download itself took a short while but when it was ready, I tried to install it. Back in February I updated to version 3.1.3 and more recently, I updated to iOS 4 and had no problems. This time, the update bar on my phone got to about a quarter full and then it just stopped. I thought it might be because it was a large update so I left it for over an hour. When I returned to my desk, it hadn’t moved. That’s when I started to panic. Obviously, I couldn’t eject my iPhone because it thought it was still updating so I just removed the USB cable. I reset it a couple of times and tried again. The update bar froze. I reset it once more. Guess what? It froze. I’d read reports on the web that some people had “bricked”* their iPhones during the update process. Apple doesn’t have any offical way of letting you downgrade the OS on the iPhone so I couldn’t get back to iOS 4. After a bit of googling, I found a way of perhaps fixing the phone (which by this point was demanding that I plug it into iTunes to restore it…but that didn’t work!). Anyway, if you’re having problems, first of all, disconnect your phone and reset it (hold the button at the top and the home button at the same time for a few seconds) and make sure you’ve closed iTunes. When you’re in the right directory, there should be a file with the extension .ipsw. Delete this. Now reconnect the phone, open iTunes and try to restore it again. Deleting the .ipsw file forces iTunes to re-download it. This time it should work (it did for me). *This is the word the cool kids use to describe an iPhone which is farked. I’d never heard of the term until tonight. Clearly I’m not cool enough.